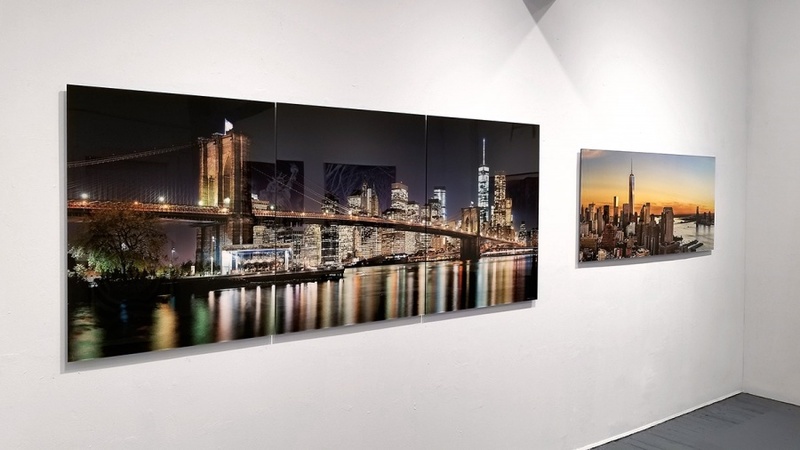 Andrew specializes in large format cityscape, landscape, and panoramic fine art prints in sizes up to 150 inches wide. In order to capture preserve such detail with large-scale prints a very high-resolution image is required. Andrew uses a 6x17cm panoramic film camera and the latest high-resolution digital cameras to capture his images at resolutions which make such scale possible. Andrew’s latest works, including his award-winning panoramas and series such as Niemeyer’s Brasilia, Gehry’s Children, and Night & Day, are offered as limited edition prints. Limited Edition prints are signed, numbered and dated and are sold with a Certificate of Authenticity. Edition sizes ranging from 10-50 prints. We offer exhibition-quality fine art prints, printed on archival photographic and giclee papers to our exacting standards. By using only the best quality materials our prints have superior tonality, color saturation, and image permanency. 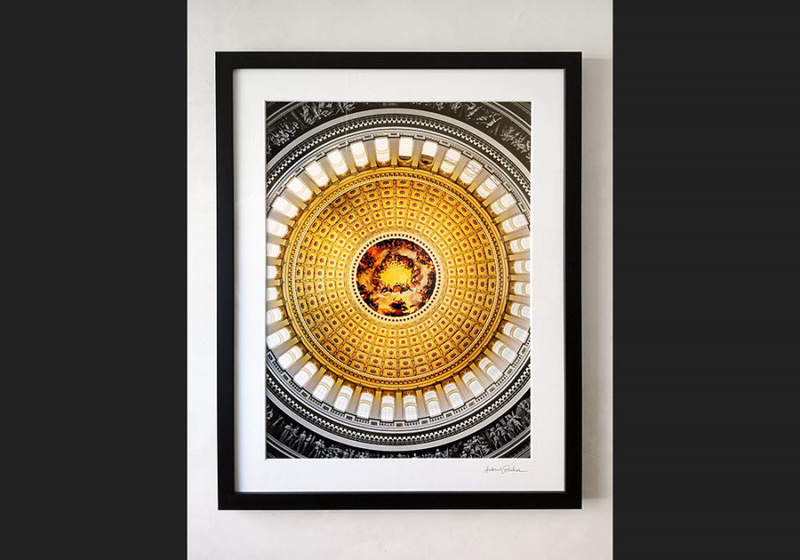 Andrew’s fine art prints have been exhibited in museums, galleries, and corporate art collections across North America and Europe. 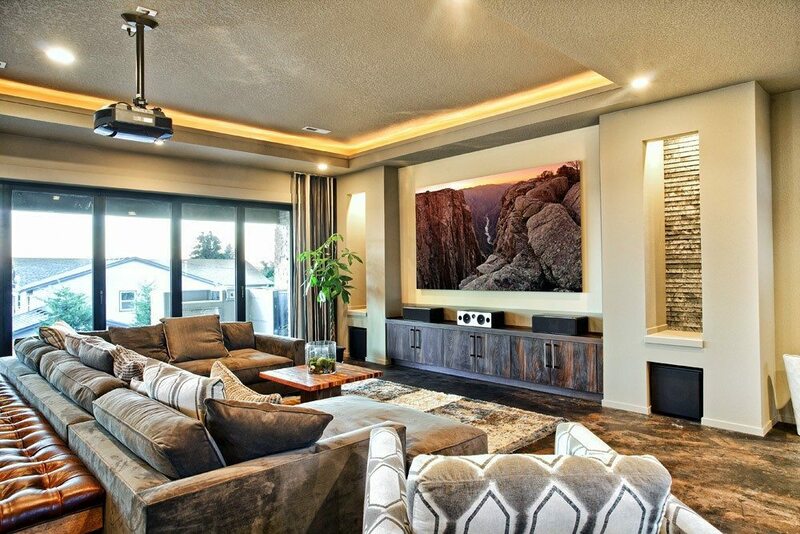 – Panoramic photos may have custom print sizes. Please refer to the photo’s page for exact sizes. Small prints are sealed in plastic and shipped flat in sturdy cardboard boxes, which ensure that the print is not damaged in transit. Larger sized prints are shipped rolled in heavy-duty tubes with padding. Framed prints are shipped flat and packed with generous amounts of cushioning packing material. 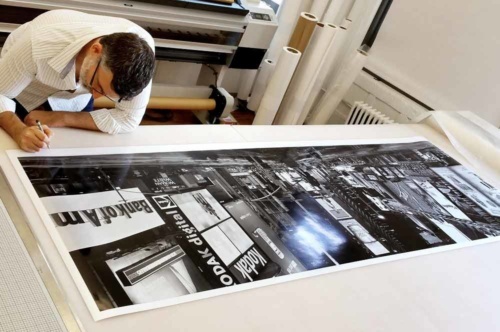 Oversized prints typically need to be crated before shipping to ensure maximum protection in transit. Please note: International customers may wish to contact us in advance for a quote of actual shipping charges. All purchases are guaranteed to be as described. Our photos are carefully inspected before they are shipped, however there is a slight chance that damage may occur in transit. It is our policy to replace prints or framing that is damaged in transit at no cost to the customer. Replacement prints are shipped only after the return and inspection of the original damaged merchandise. Photographic prints are sold for display purposes only. Scanning or copying prints in any way is considered infringement of the artist’s copyright and a violation of federal copyright law. If you are interested in using one of our images for advertising or design purposes please contact us to license the high-resolution image. Why offer two edition types? As the photography market has grown and evolved we have moved with the times. When Andrew first started selling his fine art prints fifteen years ago, open edition prints were still the norm. Over time limited editions became more prevalent, and the galleries that were purchasing Andrew’s prints for their clients mostly required that the edition be limited. In general, Andrew’s newer work is sold as limited edition prints, while images which were already being sold remained open edition prints. Where can I see your photos in person before I buy? Andrew participates in public exhibitions of his work from time to time. Exhibitions are posted on the News and Exhibitions page of our site. Artwork is printed, framed, and delivered or shipped on demand to customers around the world. We do not operate a physical retail space in New York City with inventory which can be purchased on a same-day basis. Corporate clients interested in purchasing multiple prints for their spaces can contact us to discuss a portfolio presentation. Portfolio presentations are reserved for clients with minimum budgets of $10,000. We are not able to schedule portfolio presentations for clients seeking single pieces due to our demanding production and shoot schedule. We encourage our customers to read our customer reviews and see examples of our artwork hanging in homes and corporate spaces around the world. Absolutely, please contact us to discuss. I need help choosing the right photo for my space, can you advise me? Yes we can! We want our customers to make the best choices for their decor and for their budget, so please feel free to contact us with questions! I see a logo on the images on your website, do those appear on the prints as well? I’m not located in the United States. Can I purchase the image to print the photo myself? Andrew personally supervises the printing and signing of all of his work to ensure the highest production standards and quality. For that reason we do not sell or license our images for the purpose of producing fine art prints. We have shipped our artwork to 16 countries and have the expertise in international sales to ensure that your order goes smoothly. We partner with professional framing services around the world to frame our photos locally, which reduces the cost of transporting framed artwork and customs duties at import. Please note that there is a $500 order minimum for international sales of fine art prints. Do you sell posters or other kinds of reproductions of your photos? 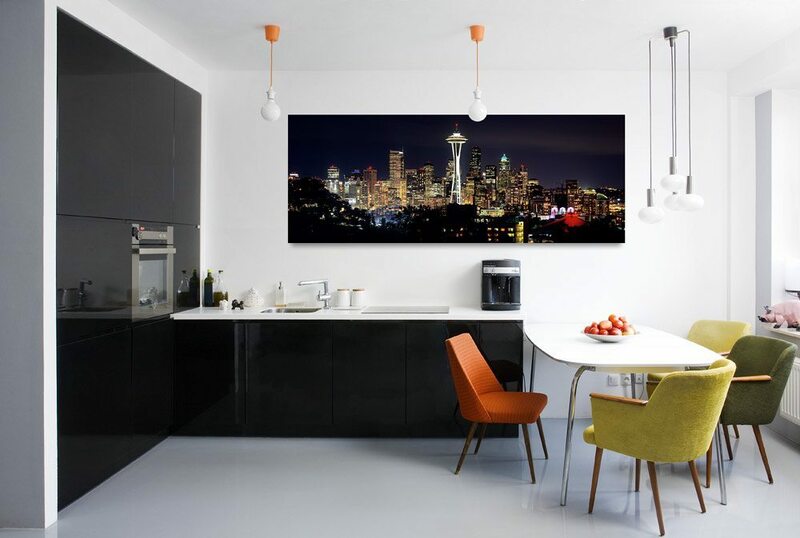 Our acrylic float-mounted prints are a strikingly modern way to display your artwork. The print is mounted onto rigid Dibond and ultra-clear acrylic is bonded to the surface. A brace is attached to the back side which floats the photo from the wall. We also offer the option to float the mounted photo in a black, white, maple, or walnut solid wood frame, or a silver metal frame. 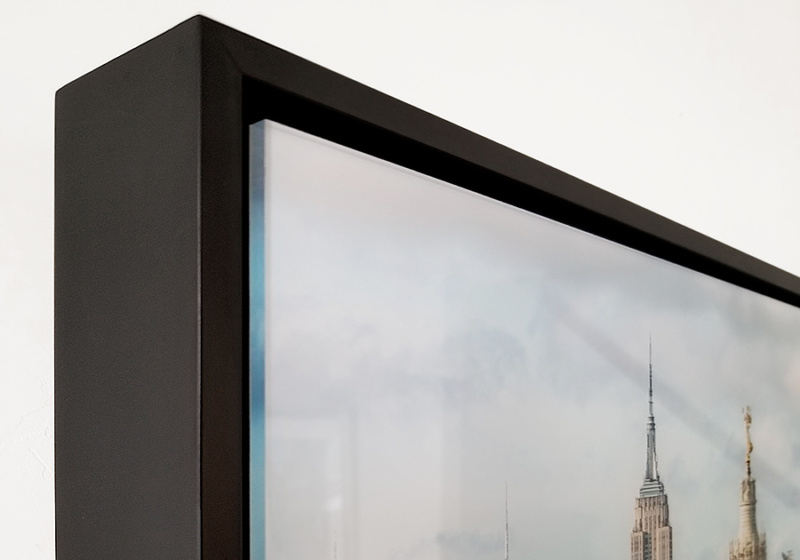 Acrylic float-mounting will give your artwork a clean, contemporary look and is the display method of choice for many high-end photography galleries. 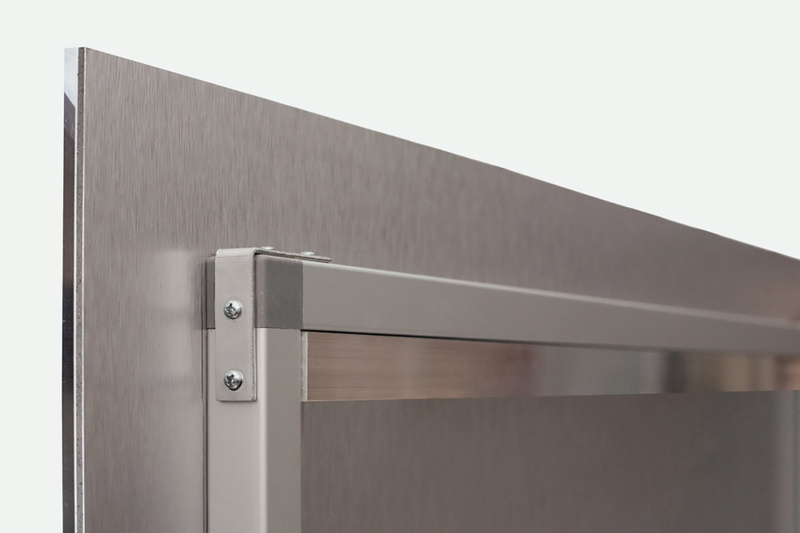 Metal printing is a revolutionary new process in which the photo is printed directly to metal plate and fused with heat to form a scratch resistant high-gloss finish. 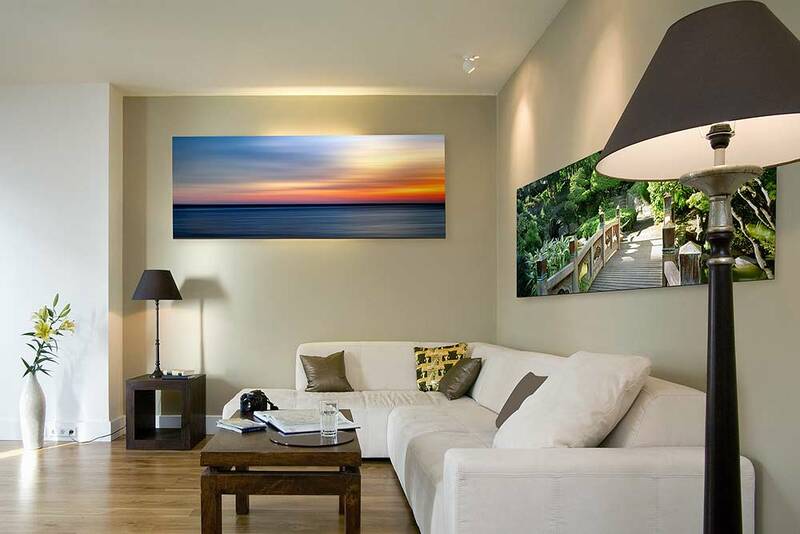 The result is a lighter and highly durable photo that can be installed in high-traffic areas. 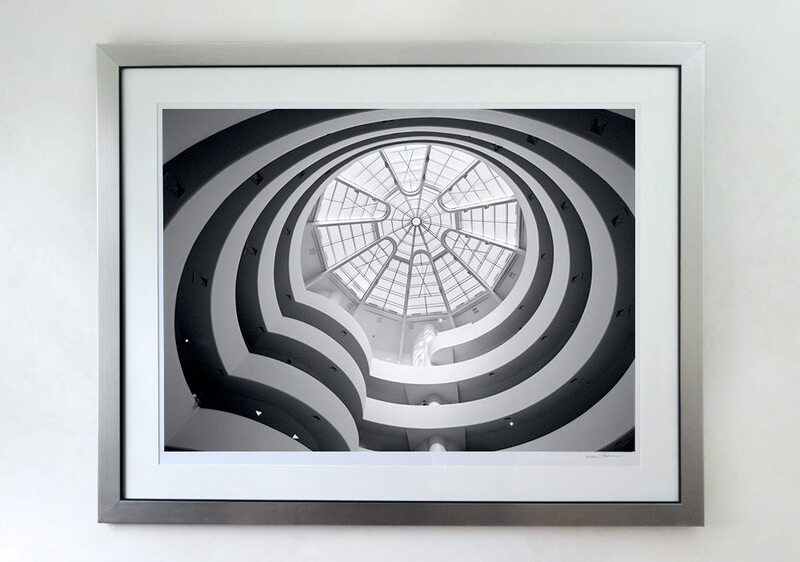 Metal prints can be recess framed or framed to edge in black, silver, or pewter color. 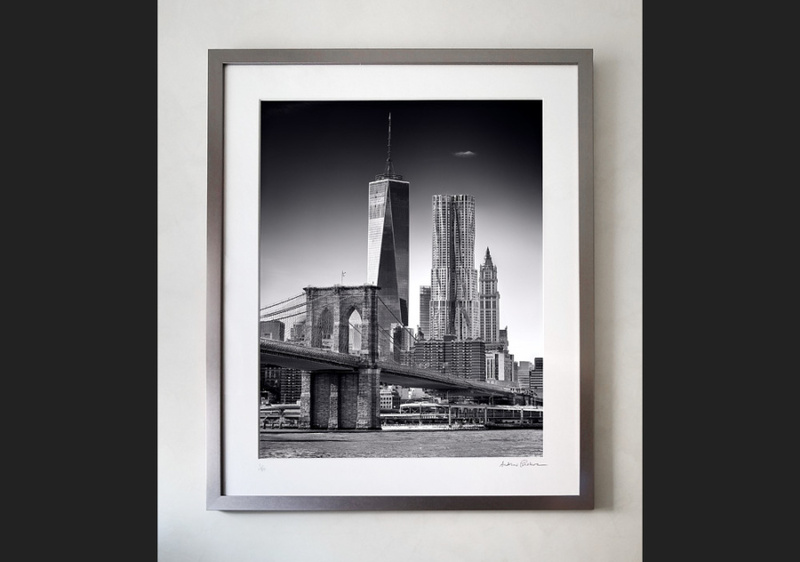 We also offer the option to float the metal print in a solid wood frame in various colors. Framed and matted photos offer a classic look suitable for any decor. We include a premium 8-ply hand-cut mat, and use only archival quality acid-free mats and framing materials. Our standard solid wood frames are offered in matte black or brushed pewter and vary from one to two inches wide. We also offer metal frames and can frame in almost any custom style upon request. Framed to edge is more contemporary look that omits the mat entirely. The photo is printed with a white border and the frame sits at the edge of the print. This style is popular with those who want to keep the framing but prefer not to have their prints matted. 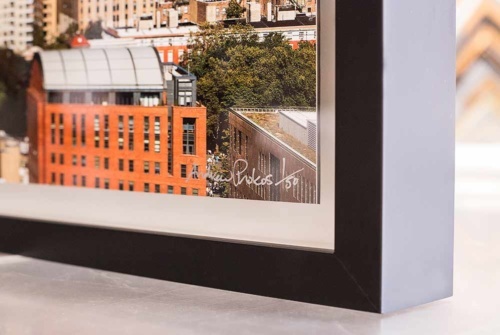 Box frames are a stunning new way to showcase your artwork. The print is mounted to a rigid dibond (aluminum) backing which floats in the box. Clear acrylic is mounted at the front of the box, creating a space between the mounted photo and the acrylic. The solid wood frames used with this style are deeper and have a narrower front face. 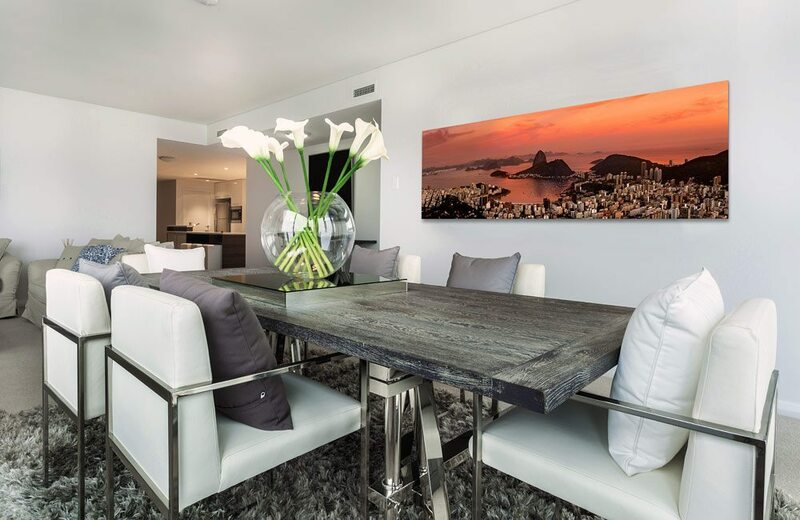 Our Artwork in Homes and Offices page shows examples of Andrew’s large format black and white and color photos installed in luxury homes and corporate spaces. 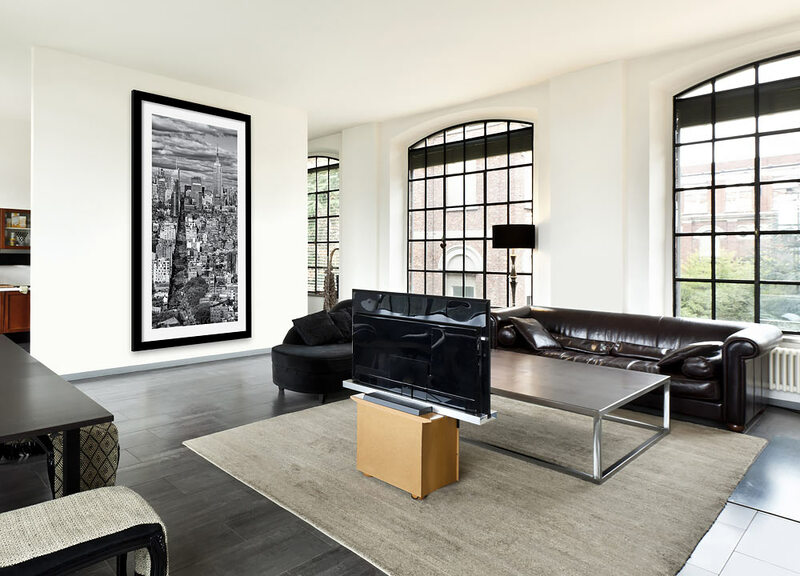 There you will find examples of Andrew’s framed photographs in the homes of customers around the world, and corporate art collections in New York and other locations. 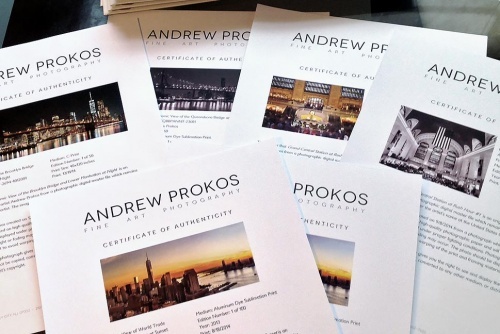 Andrew’s fine art prints are on display in luxury residences, office spaces, and corporate art collections in sixteen countries. They have been exhibited in photography galleries and museums in the U.S., Europe, and Asia. To facilitate the sale and delivery of artwork for our international clients we partner with qualified local framers, thereby eliminating the cost of shipping framed artwork internationally as well as customs duties on import.